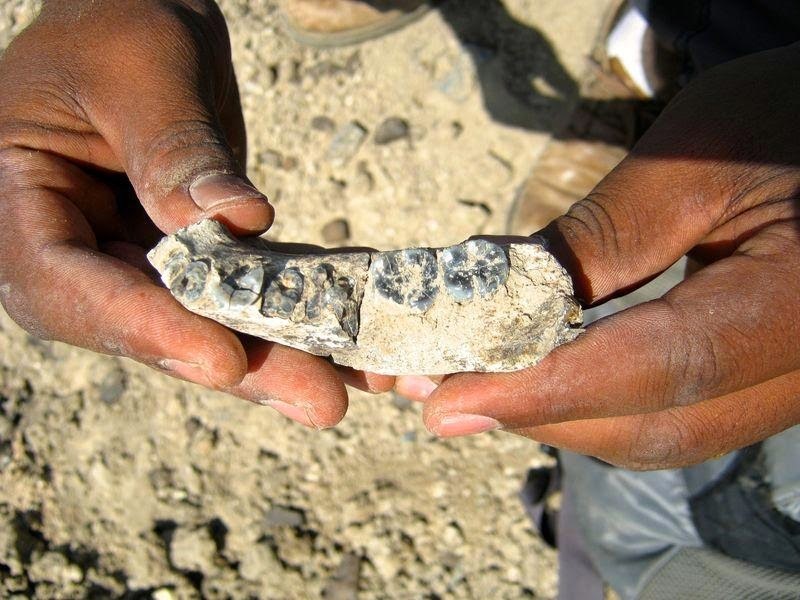 A fossil lower jawbone with five intact teeth, discovered in 2013 in the Afar region of Ethiopia, may well have pushed back the earliest known hominid by about 400,000 years to 2.8 million years ago. The huge significance of this, if it turns out to be true, is that it sits neatly in time and place between the undoubtedly australopithecine Australopithecus afarensis from the same area about 3 million years ago and the undoubtedly hominid Homo habilis, from about 2.4 million years ago, previously the earliest known hominid. The key to this new find is the distinctly hominid small teeth. In our evolutionary history, teeth reduced in size as our diet changed to include more meat and maybe when we began to cook food making it both easier to chew and easier to digest, so providing us with more nutrition which could feed an enlarging brain. Small teeth are thus strongly indicative of a species which was in the process of making this change. The teeth also reduced in size as our brains enlarged causing our facial bones to rotate to hang below our cranium so our mandible and maxilla receded to give us our flat face, protruding nose and protruding chin. This new fossil shows signs of a still sloping chin reminiscent of "Lucy" - distinctly 'transitional' between the Australopithecus genus and the Homo genus. Our understanding of the origin of the genus Homo has been hampered by a limited fossil record in eastern Africa between 2.0 and 3.0 million years ago (Ma). Here we report the discovery of a partial hominin mandible with teeth from the Ledi-Geraru research area, Afar Regional State, Ethiopia, that establishes the presence of Homo at 2.80-2.75 Ma. This specimen combines primitive traits seen in early Australopithecus with derived morphology observed in later Homo, confirming that dentognathic departures from the australopith pattern occurred early in the Homo lineage. The Ledi-Geraru discovery has implications for hypotheses about the timing and place of the origin of the genus Homo. No doubt there will be creationists rubbing their hands with glee at the thought that they now have two gaps where they can fit their god', not just the one they had to make do with before, but surely there must come a time when even the most credulous and desperate for confirmation of their dupes will see through this ploy. But of course, we still have those who cope with these fossils by simply denying that they exist and have never been found, and even that they are all forgeries or planted by their invisible friend to mislead them, but no amount of evidence is ever going to convince anyone who can't accept the possibility of being wrong and so has to pretend the evidence must be. Like many scientific discoveries this one answers some questions but also raises some others. Where, for instance, does this leave A. sediba, the distinctly 'transitional' australopithecine from South Africa? This species appears to have had a hominid lower skeleton complete with 'human' pelvis, legs and feet, and a chimpanzee-like (i.e. australopith) upper body, apart from 'human' hands? A. sediba, although from further south and probably belonging to a southern group of Australopiths rather than to a group from the Ethiopian highlands to the north-east, was a strong candidate for this 'transitional' species. There is of course the possibility of parallel evolution where an arboreal australopith was forced to adapt to ground-dwelling because climate change cleared the forests, and evolution 'solved' this in the same way. As I've pointed out before, the problem for palaeoanthropologists isn't the lack of these 'transitional' species; it's the surfit of them. There are still several ways the human evolutionary tree can be represented in detail. In the general, however, there is no doubt at all that the australopithecines diverged from stem group of African Great Apes, one of which then went on to give rise to the Pan and Gorilla genuses in West Africa while the australopithecines split into a southern and an eastern group, one of which evolved into the hominids. There is a small doubt about whether this was from the southern or eastern group but the evidence is now pointing strongly to the eastern group in Ethiopia. Another problem is that, with several species of Homo seemingly co-existing in close proximity, the genus might well have existed as an incompletely diversified 'ring species' with occasional interbreeding, such as we now have evidence for in Europe with H. sapiens, H. neanderthalensis and the 'Denisovans' apparently interbreeding occasionally. 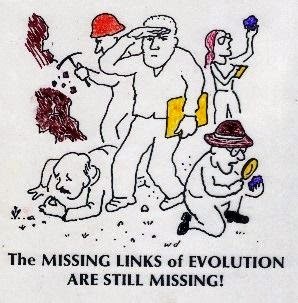 The problem as always is the difficulty in fitting a series of fossils separated by ten or hundreds of thousands of years into a taxonomic system originally intended to distinguish between contemporaneous species. What would clinch this would be DNA evidence but the probability of getting any from this new fossil is probably about zero, and we don't have any for A. afarensis, A. sediba or H. habilis anyway. Incidentally, I've already seen reports that, in the best journalistic tradition, the new Ethiopian fossil will mean we are going to have to rewrite the human evolutionary story and forget everything we thought we knew. It doesn't of course, but anything less than sensational news doesn't sell newspapers or bring people to websites quite like wanting to see how those 'mad scientists' who think they know it all got it all wrong again. In fact, if this fossil turns out to be what it looks like - an intermediate between the Australopithecus genus and the Homo genus, it will actually confirm what we suspected and the only rewriting needed will be to include it in the provisional human evolutionary tree as we believe it to be today. Coming close on top of the two recent papers dealing with transitional fossils linking the reptiles and the mammals, some people might expect creationist pseudoscientists to start revising their arguments and come up with one which isn't so easily and frequently shown to be a lie, until one remembers that they are selling to a market which isn't bothered about truth and can be guaranteed not to check in case their sacred conclusion turns out to be wrong, and that will never do.